Last week, Town Hall Symphony Hall welcomed partner primary schools and children centres from Ladywood and Falcon Lodge to Town Hall where they were given free tickets to watch the stage adaption of The Tiger Who Came To Tea. For many of these children, this will be the first time that they experience a live, staged performance. Law firm Pinsent Masons provided financial support for the annual Generation Ladywood Welcome Reception on Tuesday, which enabled over 600 local school children to attend the show. Members of the firm also volunteered at the performance to meet and greet audience members and hand out event programmes. Pinsent Masons is delighted to support the Generation Ladywood Welcome Reception presentation of the Tiger Who Came to Tea. The key focus of our community investment programme is “inspiring young lives”, and this is undoubtedly what The Welcome Reception achieves, bringing music and the arts to young people and their families in Ladywood. Thank you yet again for organising such a wonderful performance!...The children really enjoyed the play and talked about it all afternoon. They remembered the songs and actions and sang it with their friends. One little boy even said "If the Tiger came to my house I would give him roti (chapatti)! Families from Newhall Primary and Soho and Bertram Children’s Centres were even granted the opportunity to meet this lovable big cat on stage following one of the performances this week. Here they showcased their best tiger impressions and were thrilled to meet the cast following the performance! 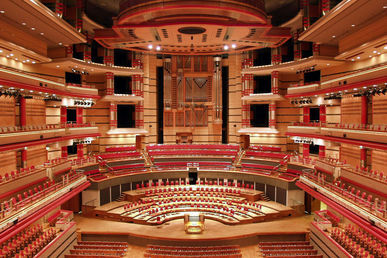 The tickets for the Ladywood primary schools and children’s centres were made possible as part of Town Hall Symphony Hall's Generation Ladywood campaign which enables over 18,000 engagements each year through a range of musical opportunities for children, young people and adults within our local Ladywood constituency. The tickets for our partner Live in the Lodge primary school were made possible through generous funding from Sutton Coldfield Charitable Trust and Royal Sutton Town Council.